Yesterday, my husband and I went to a one day intensive on Creativity, run by Michael Atavar at The School of Life. It was a play-filled, hands-on workshop with an interesting and diverse group of people. Amongst other things, we were asked to write a short piece about a game we used to play as children. Later in the day, we were asked to deconstruct it, using craft knifes or by tearing the paper, then to reconstruct it in a random manner without any thought. My resulting piece was astonishingly poetic. There was very little thought in how these pieces came together. A lot of them were upside-down when I selected them, so I had no idea of the words until they had glue on them and were stuck to the paper. I prefer this version of the writing to the original. This one simple exercise flipped me upside down. I’ve never done this process before, though I know the cut-up technique has been around for a very long time and was used by William Burroughs to write Naked Lunch. I will definitely be using it again when I feel creatively stuck. Have you ever used this process? 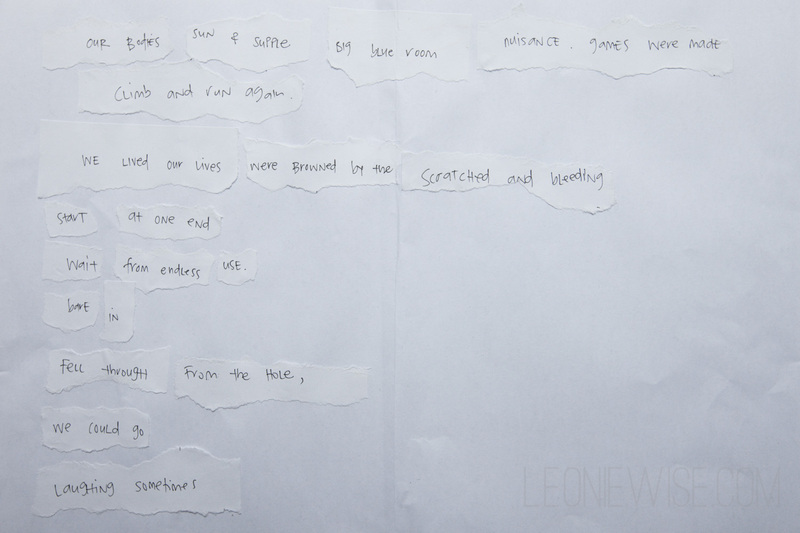 This entry was posted in poetry and tagged create, london, poem, the school of life. Bookmark the permalink. i love your resulting poem and will def. be trying this! love it! I have done this and taught/shared the method in workshops before. I find there is a special rawness and vulnerability that comes through (for me at least), unfiltered and intimate. This is beautiful…I’ve never used the cutout technique but, wow, you’ve demonstrated how powerful and profound it can be. Wonderful! Thanks so much for sharing.